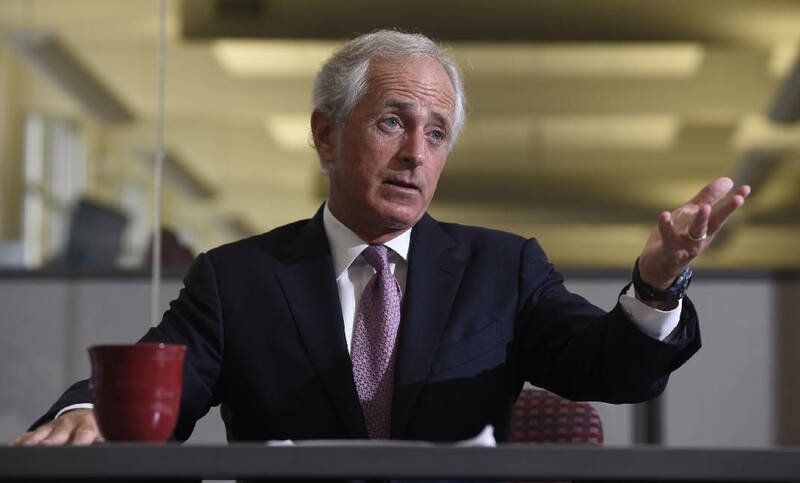 U.S. Sen. Bob Corker, R-Tenn., says while the July 16 shootings here underscore the "new world we live in," Chattanoogans shouldn't give in to the nation's enemies by "dramatically changing" how they live. Speaking with Times Free Press editors and reporters Wednesday, the former Chattanooga mayor was asked about issues including security concerns at the Navy and Marine Operational Support Center on Amnicola Highway. Mohammad Youssef Abdulazeez killed four Marines and a sailor during a bloody rampage there just after shooting up a U.S. military recruiting center on Lee Highway and wounding a Marine recruiter and a police officer. Federal officials investigating the attacks describe 24-year-old Abulazeez as a "homegrown violent extremist." But at last week's memorial service in Chattanooga, Vice President Joe Biden called Abdulazeez a "perverted jihadist." Asked to comment on Biden's remarks, Corker declined. "I'll let his comments stand on their own," he said. "I could make an off-the-record comment, but I won't." Corker said the center was moved from the North Shore to Amnicola Highway when Gene Roberts was mayor. It opened up riverfront property that became Coolidge Park, a centerpiece that helped fuel North Shore development. "They decided Amnicola was the appropriate location for them due to the transportation and proximity to other things they wanted to have," Corker said of the military. "But look, an urban setting like we have, you're going to have facilities. We have a police facility almost across the street." As for whether the heavy use of the Tennessee Riverpark poses any problems for the Naval Center or vice versa, Corker said, "Y'all are asking questions that cause me a degree of concern. "With ISIS and social media and the things that are happening to attract young people who are despondent — who feel like they don't have a future and want to be a part of something that is bigger than themselves — this is the world that we today live in," he continued. "If we're going to begin all of a sudden dramatically changing the way we live in a community like Chattanooga, that causes them to be winning," Corker said. "And it's not a place I really want to go." The riverwalk passes in front of the Navy and Marine center and a playground is nearby. Some of the Mike Battery Marines who work in the building later told the Times Free Press how they ran through the riverpark, pulling passersby away from the ongoing shooting. One Marine described scooping up a young child and carrying him through the playground. Corker said he has "just been overwhelmed by the community's response" to the shootings. "I think it speaks so much to our community and the way that it is. I know there'll be significant outpouring of charitable resources towards those families. We have met and coordinated with the folks in the military." Asked about efforts by U.S. Rep. Chuck Fleischmann, R-Tenn., to pass legislation awarding the slain servicemen Purple Hearts, Corker said, "I don't want to interject myself into what the appropriate ways of these outstanding men being honored is. I feel certain that these men will be honored in the appropriate manner." Corker also spoke of joining with Denver Broncos quarterback Peyton Manning in creating the Chattanooga Heroes Fund to support families of those killed or injured in Abdulazeez's attack. "[W]e're trying to address the needs of these families in a really tangible way and in a way that will have impact," he said. "What we haven't done is try to get out there and take the situation and move too quickly towards a legislative solution." Corker, who is chairman of the Senate Foreign Relations Committee, also sharply criticized efforts by President Barack Obama's administration to combat the Islamic State. "We don't even have a commander — you understand? — in charge of focusing on the ISIS issue," Corker said. "We aren't focusing in a coordinated way on the elements of financing. It's being dealt with but there's no centrality to it." The senator also acknowledged it's going to be difficult to stop the administration's nuclear deal with Iran. The Republican-dominated Senate can easily pass Corker's bill blocking it, Corker said. But bringing along enough Democrats to get 67 votes to override Obama's expected veto will be a "heavy lift," although he said he's not giving up. On the political front, Corker said he was "fascinated" by last week's Republican presidential debate. He said he would have scored it differently than GOP primary voters later did in polling. "I don't know how long it's going to last, and I don't how candidates evolve over time," he said. "At some point in time people are going to have to address the issues with real responses." Asked how he scored the debate, which left billionaire businessman and reality TV star Donald Trump still commanding many GOP voters' affections, Corker said, "I'm not going to say."